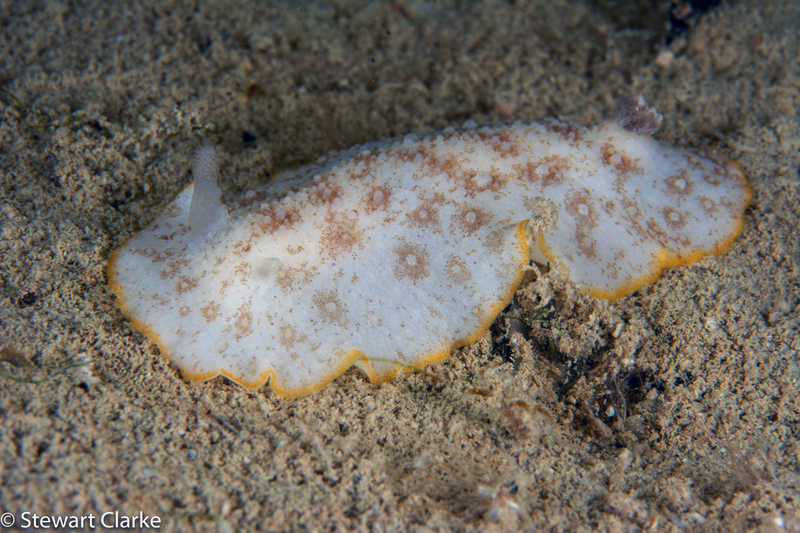 Stewart keeps sending us these amazing undescribed species for Yas Marina in Abu Dhabi, UAE, like Goniobranchus sp. 22 and 23 in NSSI 2nd ed. Not having seen the animal myself and relying on a series of photos from Stewart, I am guessing this is a Dendrodoris because of the elongate body, the presence of notal tubercles and the gill situated near the posterior end of the body. This is a genus lacking a radula, which is replaced by a buccal mass that spits digestive juices on their sponge prey, and after the sponge softens, slurps the resulting soup up. Like many species in this genus, the coloration seems to vary greatly, from dark brown to white. Consistent characteristics between individuals are the numerous white tubercles, some surrounded by brown specks, like above, and a yellow marginal band. In most the rhinophores and gill are white, but some have minute brown flecks. The part of the marina where Stewart has made so many discoveries is shallow, covered with mussels and sponges. These two filter feeders surely keep the water very clear. 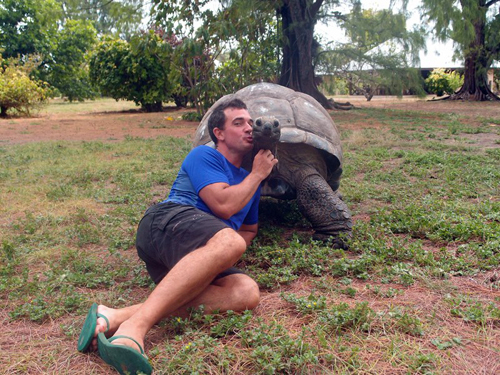 Stewart has been living and working in the United Arab Emirates for over 10 years after escaping from the grey skies of the UK. 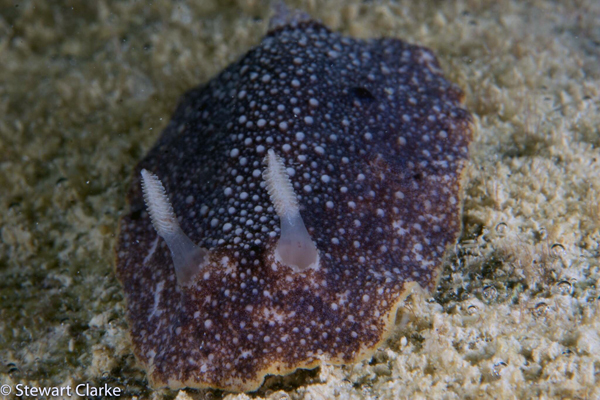 For over half of that time he has been systematically searching for Nudibranchs in the surrounding waters of Eastern Arabia, and to date has recorded over 320 species for the area. He believes a number of the obscure species he finds are being brought in via the ballast water of oil tankers, especially those being found in and around the oil terminal in Fujairah. 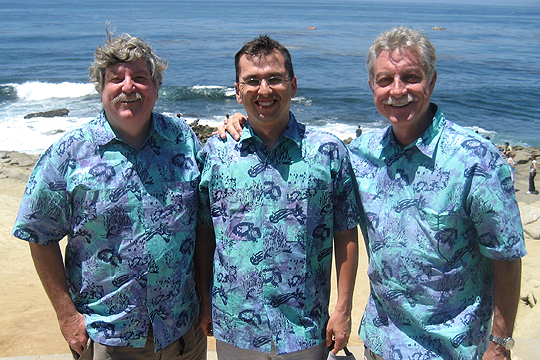 He helps run a Facebook page called UAEbranchers that records and discusses local Nudibranch discoveries. 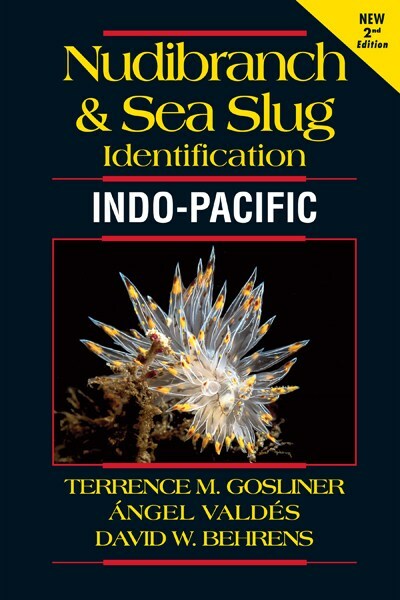 WEBMASTER'S NOTES: By the way folks, one of Stewart's images graces the cover of the new Nudibranchs and Sea Slugs - Indo-Pacific edition!